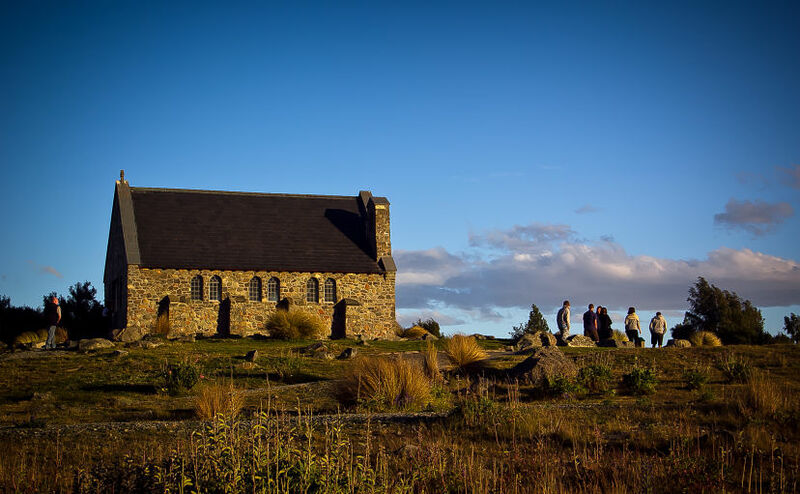 At sunset, the pretty little Church of the Good Shepherd overlooking the milky blue water of Lake Tekapo becomes even nicer, with its brick walls getting shades in gold . It’s also the time when often groups of tourists arrive to take a few pictures and the place might become a little (relatively speaking) crowded, but on a good day the light is so special that it’s well worth a stop. Recent, like everything in New Zealand (it was built in 1935) the Church of the Good Shepherd may not be a remarkable building but it overlooks a very scenic point and adds to the charm of the view. Only a few take the time to spend a few days in Lake Tekapo, to enjoy the calm of this small village and the superb scenery. Most make a quick stop, take a few photos and then they’re on the road again. Pity, because it’s where I spent some of the best days of my New Zealand wild journey. Beautiful photo of the church. I haven’t been to New Zealand yet, but really want to go. I will definitely want to spend a couple days in Lake Tekapo. Lake Tekapo is enchanting and peaceful. I had a great time there and I’m sure you would, Katherine.